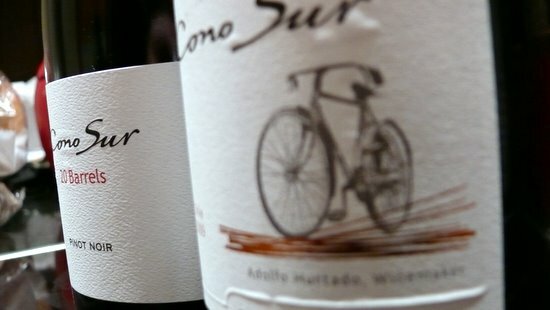 Question: Above are two Cono Sur wines, the standard pinot noir – commonly known, for obvious reasons, as “bicycle”, and the triple-the-price 20 Barrels pinot noir. What’s the main difference between them? Answer: Nearly half a kilogram. The 20 Barrels isn’t even Cono Sur’s premium pinot, that honour going to the presumably heavier still Ocio. I must say I’m puzzled that wineries feel the need to waste money and energy on buying and shipping hefty bottles to denote higher quality contents, when the price tag attached to the wine will do the same job just as well (and would be a bit smaller without them). The difference on this occasion was, to be precise, 444g – a full bottle of the Bicycle pinot weighs in at 1.192kg, its big brother at 1.636kg. Cono Sur is otherwise pretty eco-friendly as absolutely massive winemaking behemoths go, so much so that some of their vineyards are kept weed- and pest-free through the winter by flocks of marauding geese. The choice of emblem for their basic pinot, the bicycle, “symbolises our spirit of innovation, passion, commitment and respect for the environment,” they say. They could do a little bit better. The 20 Barrels, at £19.99 from Morrisons or Waitrose, is obviously in a totally different price bracket. Where much of the Bicycle’s fruit is machine harvested and just a fraction – 35% to be precise – spends six months in oak (the rest hanging out in stainless steel tanks), all of the 20 Barrels wine relaxes in barrels for an entire year. The result is more spiciness, with cinnamon and smoke coming through, and riper, darker fruit. Though the 2008 I tried wasn’t terribly old – just a year older than the Bicycle, and bottled a mere five months earlier – it looked a lot older than I’d have expected, browning at the rim. This was a bit surprising in what’s still a pretty young wine, but gave it quite attractive maturity that’s rare in an off-the-shelf wine and makes it without reservation ready to drink right now. It beats the Bicycle on every measure other than value: it’s good stuff, but in the £20 a bottle range it does have a lot of other good stuff to compete with. * On the subject of wines I wouldn’t hestitate to buy, Tesco’s online wine-selling arm are currently knocking off Penfolds Bin 28 Kalimna Shiraz for £6.64 a bottle here. If you’re quick, you can use the code XXHHN4 to bring that price down to £5.85 a bottle, after delivery charges. It’s a big, bold, ripe Australian belter, based on Barossa fruit, and the 2008 – which should be what you get – is reckoned to be one of the best vintages in yonks. To illustrate how good a price that is, it’s also on offer at Majestic, where the offer price is £10.99, down from a standard £13.99. Wine Rack and Avery’s both list it at £13.99. Buy it and drink it over the next 30 years – it’s got a reputation for standing the test of time. This entry was posted in Uncategorized and tagged 20 barrels, bicycle, cono sur, Pinot noir. Bookmark the permalink.